What Can a Shipping Container Structure Interior Look Like? Many people initially imagine the interior of a shipping container structure would look like its exterior— corrugated steel walls — but this is rarely the case. As discussed in our blog post about insulation, plain steel walls get hot in the summer and cold in the winter. To create climate-controlled spaces we always install insulation. If the container will be occupied, we add interior framing and paneling. Once the wood or drywall is installed and painted, container structure interiors look like those of any other building. To demonstrate, let’s take a look at common wall paneling options. The advantages of drywall are mostly aesthetic. The structure will look exactly like a typical brick and mortar building on the inside. The seams between drywall panels will be invisible once finished and painted. Our own container-based office building is partly finished out with drywall to create a space that balances the industrial look of the containers with a more traditional office aesthetic. When considering drywall be sure think about how the container will be used. If the shipping containers are going to form a permanent building, drywall can be installed off-site by the manufacturer or on-site by a local contractor. If the container will be regularly relocated, drywall may not be the best option because over time, the vibrations of the road may crack the walls. Consult with your container structure manufacturer to determine if drywall will work for your project. Sanded wood paneling is a great option for office and living spaces that will be relocated through-out their use. The cabinet grade wood has a tight grain and smooth finish, keeping the texture from the grain to a minimum. The walls appear smooth once painted over, and trim strips cover the seams between two adjacent panels. Sanded wood paneling is flexible enough to weather regular relocations without damage, making it ideal for field offices and mobile workforce housing. A plywood interior is less expensive than sanded paneling, but the texture is more pronounced. You can see knots and ripples in the grain even when the plywood is painted over, and the seams between the panels are uncovered. People usually choose plywood paneling for workshops and climate-controlled tool sheds, where it’s okay for the interior to look a bit more rough around the edges. FRP is plywood paneling covered with a textured white plastic. Like the sanded-paneling, we cover the seams between panels with trim strips. The great thing about FRP is that it’s washable. 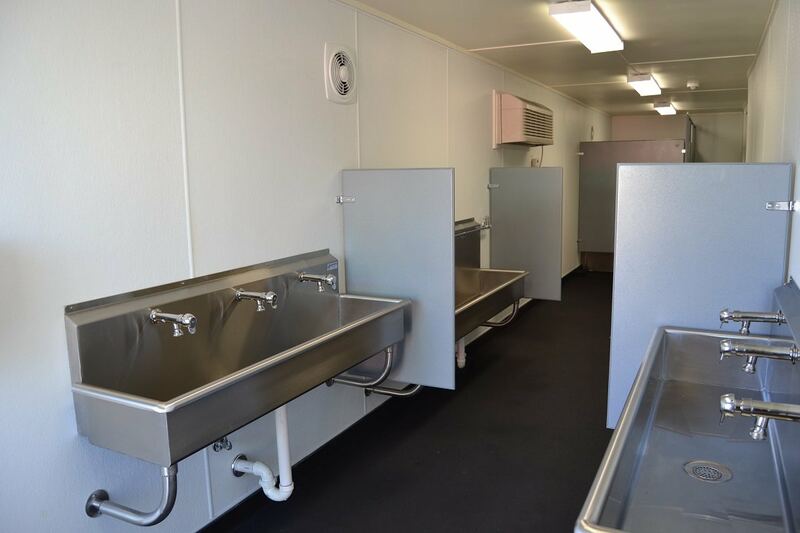 If a container will be used as a mobile bathroom, we usually install FRP walls so the interior walls can be hosed down during cleaning. If you absolutely can’t risk having any pests in your container structure or people won’t spend long periods of time in the container, steel or aluminum walls paired with spray foam insulation may be an appropriate solution. While more expensive, metal walls have helped customers clear customs when moving their container structures overseas and protect highly sensitive equipment for water treatment plants. You will see the seams between the metal panels, but the interior can be very sleek for the right application. 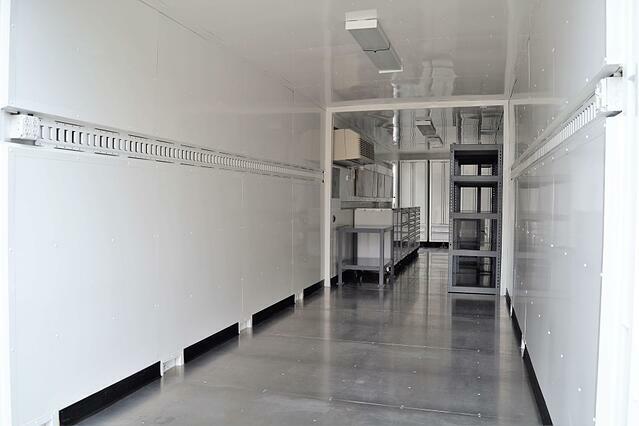 Black Swan Racing embraced the industrial look of aluminum walls, and the results were perfect for their mobile car garage. 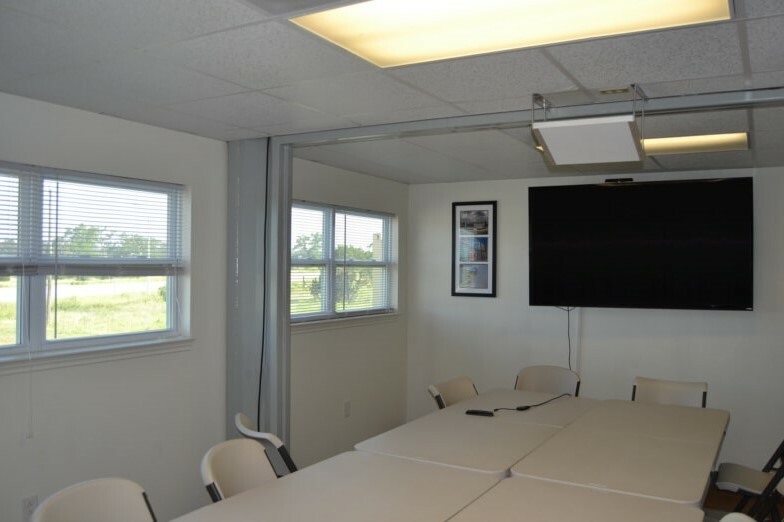 Industrial equipment can be loud, so a growing number of people are installing sound deadening insulation covered by perforated steel to create a quiet space for labs and offices. While policies range from county to county, mobile container structures are generally treated like trailers or RVs, and thus installing walls and electrical off-site would likely be acceptable. However, if the container will be part of a permanent structure, your local authority having jurisdiction will likely want an inspector to check the wiring, framing, and plumbing before you add paneling. 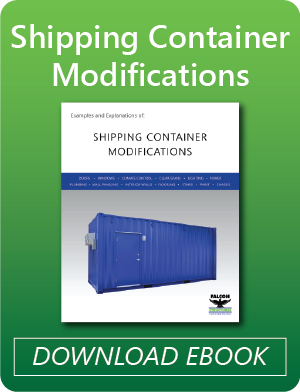 If permitting looks like it will be a challenge some people obtain an AC462 code-compliant container from their container structure manufacturer and then hire a local contractor to finish-out the walls when creating a permanent structure. Your container manufacturer will probably have experience with both approaches and guide you on the best way to proceed. 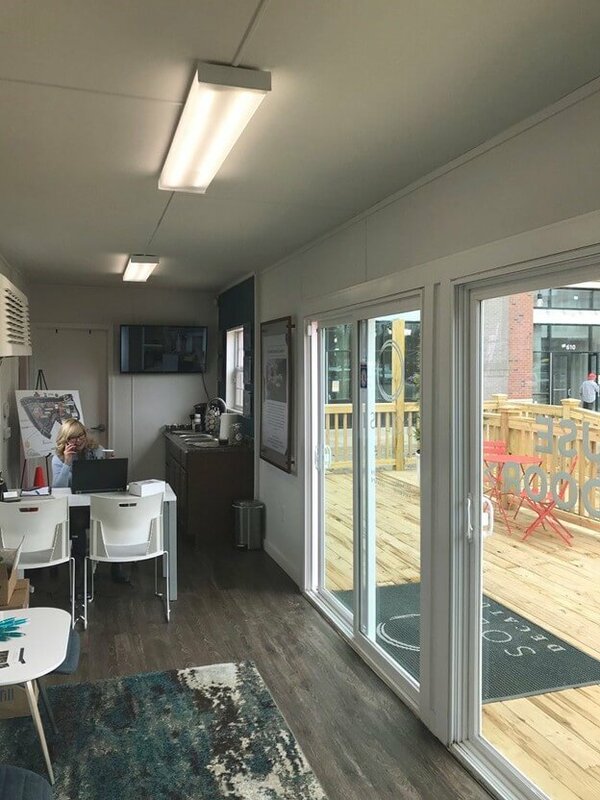 If you’re thinking about creating a shipping container office or living space, and you have more questions about interior finishes, give us a call at 877-704-0177 or contact us online. We’re happy to answer your questions.